ABBA has sold nearly 500 million records since the band emerged from Sweden in the north of Europe to take the world by storm. 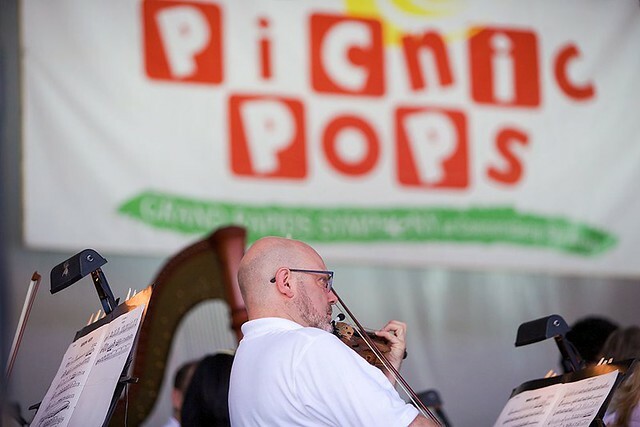 At Thursday’s opening of the Grand Rapids Symphony’s D&W Fresh Market Picnic Pops, they probably could have sold a few hundred more. Remarkably, ABBA wasn’t on stage. Arrival from Sweden was along with Grand Rapids Pops led by Principal Pops Conductor Bob Bernhardt. That was close enough, right down to the authentic stage costumes worn by lead singers Madelene Johansson and Victoria Norback. By the end of the evening, the floor in front of the stage was packed with dancers, plus at least one bouncing beach ball as well as a Swedish flag passed from the audience to the singers on stage. The Music of ABBA opened the Grand Rapids Symphony’s D&W Fresh Market Picnic Pops with music for dancing and remembering. The show repeats at 7:30 p.m. Friday, July 14, at Cannonsburg Ski Area. Gates at Cannonsburg Ski Area open at 5:45 p.m. each night for picnicking and pre-concert entertainment. Tickets for The Music of ABBA on the day of the show start at $24 for adults, $20 for college students and seniors, and $10 for ages 2-18 for lawn seats. Call (616) 454-9451 ext. 4 for tickets. At least 21 full-length songs plus a few more tucked in medleys entertained the audience full of dancing queens to open the 23rd Picnic Pops Season. Arrival from Sweden has been ABBA for longer than ABBA was ABBA. The Swedish super group, much like the Beatles, flourished only for a single decade. Arrival, on the other hand has been in the business since 1995. Over 22 years, the group has toured the United States 51 times. The group’s appearance with the Grand Rapids Pops, in fact, is the final dates on a four-week U.S. tour. Arrival also has appeared with 60 different orchestras, and lead singer Norback referred to Grand Rapids Symphony as fantastic. ABBA’s success is easy enough to explain. Songwriters Björn Ulvaeus and Benny Andersson wrote bright, bouncy songs with infectious hooks including deceptive rhythms and harmonic shifts that surprised and delighted audiences. Singers Agnetha Fältskog and Anni-Frid Lyngstad sold the songs. The rest is musical history. Several songs including Waterloo, ABBA’s breakout hit that won the 1974 Eurovision Song Contest, were performed by Arrival alone. Other songs, including Money, Money, Monday, were arranged with plenty for the Grand Rapids Symphony to play, recreating the song as it originally was heard. On the flip side, the singers all left the stage for an energetic instrumental titled, simply, Intermezzo No. 1, which the band performed with the Grand Rapids Symphony. Though the expected well-known songs, including Voulez Vous and Gimme Gimme, were played, there were a few surprises in the show. Victoria Norback, who sings the part of Anni-Frid Lyngstad, the brunette, sang a captivating version of I Wonder (Departure), a song from ABBA’s 1977 recording ABBA: The Album that was part of the group’s mini-musical, The Girl With The Golden Hair. Madelene Johannsson, who sings the part of Agnetha Fältskog, the blonde, brought the house down with The Winner Takes It All, a hit from late in ABBA’s career when the two married couples in ABBA were divorcing. Arrival most definitely performed the songs people came to hear including Fernando in both its original Swedish version and its better-known English version. Mamma Mia, which spawned a musical and a movie, concluded the first half with a bang. Take A Chance On Me did the same toward the end of the second half. That might have been the end, but it wasn’t. A first encore of Thank You For The Music might have been enough for some, but not for the Grand Rapids Pops audience. The final, final encore, Dancing Queen, sent people dancing into the streets as only the music of ABBA can.